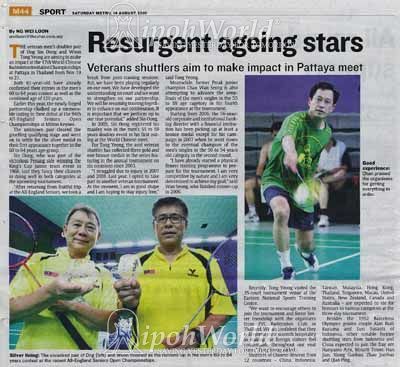 The article talks about three veteran badminton players - Ong Sin Oong, Woon Tong Yeong and Chan Wan Seong. The three of them will take part in the 17th World Chinese Badminton Championship in Pattaya, Thailand (from November 19th to 21st 2010). Chan Wan Seong was a former Perak Junior Champion badminton player, and it is said that he attempts to advance into the semi-finals in the 55-59 age category. Ong Sin Oong and Woon Tong Yeong, on the other hand, will compete in the 60-64 age category. The article further explains the players' training and preparation for the coming tournament. "It was luck for the third time for veteran shuttler Chan Wan Seong when he fulfilled his dream of advancing to medal play-off rounds of the men’s 55 to 59 years singles contest at 96th All-England Seniors Championships at Milton Keynes recently. Having failed to go beyond the group stages finishing as the group runner-up in his previous two attempts, the 58-year-old corporate and institutional banking director said he was satisfied with his effort in making a breakthrough and a place in the last four before completing his recent campaign as the runner-up of the event. “It was great that I have turned my dream into reality. I have trained diligently towards my goal. I am satisfied that my hard work and sacrifices have paid dividends." “I am glad that I survived the punishing pace. It was a tough tournament. For a start, it is not a walk in the park dealing with the tight competition schedule. I was on the court for more than five hours in one day to compete in the singles event alone,” he added. On route to settling for second, Wan Seong chalked up a total of 12 games from five matches including two encounters that were decided over three games. Getting it right : Wan Seong in action. Despite dropping a match 19-21, 21-13, 18-21 against the second seed Christer Forsgren of Sweden and completed his group matches as the second in the standings, it was good enough for Wan Seong to continue his journey in tussling for supremacy in the semi-finals. After chalking up two wins over England’s Wong Seng (21-10, 21-16) and David Stopgate (21-7, 21-8) of Wales in the two other group matches, Wan Seong kept his hopes alive and qualified for the semi-finals as the best runner-up from three groups. He went on to create an upset ending the campaign of the top seed Karsten Meier of Denmark to book his place in the final. Following a 21-15 win over the previous runner-up Meier in the opening game, Wan Seong shot ahead for a healthy 20-15 lead in the second game but could not wrap up the encounter. And Meier took his chances well to force the match down to the wire and stayed in contention winning 23-21 in the second game. “Going into the match, I did not expect to upstage the favourite. I got too excited at the closing stages of the second game. I blew away five consecutive match points in the erratic spell." “I just committed too many mistakes and allowed him to level at 20-20. I recovered from the setback and led all the way before registering an easier 21-12 win in the decider. “I shouted in joy when I nailed the winner,” said Wan Seong, adding that everyone was shocked with him pulling off the surprise feat against a higher ranked opponent. Remembrance : Wan Seong’s trophy. Earlier in the group stages, Meier bounced back from a game down before fending off the challenge from former Malaysian Thomas Cupper Kwek Chiew Peng in three games (19-21, 21-14, 21-14). Wan Seong also paired with Chiew Peng in the men’s doubles contest in the recent outing. Having engaged in a lengthy encounter against the lanky Forsgren in the group match, Wan Seong could not reproduce the forceful fighting performance and offer the similar resistance to prevent the second seed Forsgren from winning 21-16, 21-17 in the final. Wan Seong admitted the gruelling match against Meier in the last four took its toll and the strain on his right knee and calf, restricting his mobility in the final as well as the men’s 55 to 59 years doubles on the following day . “My muscles were stiff and tight. It affected my movement around the court. I struggled to cope with the fast pace,” he added. The combination of Wan Seong-Chiew Peng finished third in their group with one win and two losses in the doubles event. The duo scored their only win over Denis Cleary-Peter Preston of Wales 21-19, 21-16 but they did not go down without giving a fight against eventual runners-up Victor Sim-Philip Choo of Singapore and Sweden’s Christer Forsgren-Curt Ingedahl. The recent fruitful outing has boosted Wan Seong’s confidence and he remains hopeful to continue attaining respectable results in two upcoming tournaments. The seasoned campaigner will be joining the fray at the 41st Morning Cup in Kuala Lumpur in July followed by another outing at the 19th World Chinese Badminton Championships Changchun Jilin, China in September."